You are going to love this meaty version of this Oriental cole slaw. In a small bowl, whisk together oil, rice vinegar, sugar, pepper and contents of seasoning packets from noodles. Set aside. In a large saucepan, bring a large amount of water to boiling. Add the noodles and cook for 2 to 3 minutes or just tender. Drain and transfer to a large bowl. Pour 1/4 cup of the oil/vinegar mixture over noodles and toss to coat. 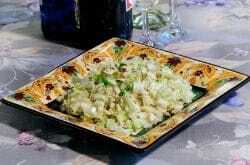 Add the chicken, cabbage, sliced almonds, chopped onion and sunflower seed kernels to noodle mixture and mix well. Pour the remaining oil/vinegar mixture over the salad. Toss to combine. Cover and chill for 2 to 24 hours. Can this Oriental Coleslaw be frozen for later use? I don’t think it would be advisable, I think the crunchy noodles would get soft. I think it would be edible, it just wouldn’t as nice crisp and fresh as it would the first time it was served.